Hello. 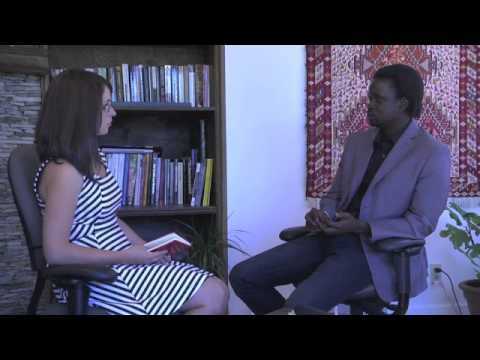 We're here today with Kuir Garang, from South Sudan, who is an author, poet and publisher living in Calgary, and a great reflector on South Sudanese politics and life. So, my name is Kuir Garang, and I was born in South Sudan in 1980, and I lived in Sudan most of my life, but then as many people know Sudan was embroiled in civil war from 1955 and then a year before independence 1972, and then started again in 1983 until 2005. So, that actually has a very big impact on how I lived. I had to seek refuge in Ethiopia with my family because of the war, the Second Civil War. So, I went to Ethiopia, that's where I started my schooling. And then when the Ethiopian government was overthrown because it was communist based, it was a communist government - during the fall of the communist government in Russia - so, Ethiopia also fell. Can you tell me about the year? It was 1991. So, 1991 we had to move back to Sudan, and in Sudan it was still in a state of war, so we had to move from refugee camp to refugee camp. It was a difficult because it is a state of uncertainty. You can not, for example, even if the administrators want to establish a school, they can establish, then maybe in three months people move because people get attacked, or there's no food there, people have to move in search of food. So, if agencies, international aid agencies can not come to us, then we have to move somewhere closer to them. So, I had to. In 1995, I told my father I wanted to go to school. There were no schools there and people kept on moving, and he used to tell me: "Oh, the war will end." And I said: "We don't know when the war will end." He was someone who was, you know, positive. He had this positive attitude. So, I moved to Kakuma in northern Kenya in 1995, so I lived there until 2002 when I came to Canada through a special program. What's it like living in the middle of a war? There's something many people need to understand. When you live in that situation, that becomes your life, that is your world, you have to get used to it. So, when someone, for example in Canada, looks at that situation, they see it with a sense of horror, they think it's something horrible. But the person living it, doesn't see it that way. You have to get used to it. It's bad, but you have to be mentally used to it. That's your life. That's where you were born, that's what you are used to. It's different, say, if I'm Canada, if I go back now, my perception of the situation will be different because I will have a different angle. But once you live in that situation, you have to adapt, it becomes your life. A typical day, for example when we're in Ethiopia it was okay. The SPLM (Sudan People's Liberation Movement), which was fighting the government [of Sudan] had communist ideas, and the government in Ethiopia was actually communist based. So, they actually supported the SPLM. So, when we lived in Ethiopia, we were not like refugees, we're free to move around. So, when we're Ethiopia, until 1991, I didn't even know what it means to be a refugee because it was just like our home, because they received us like the citizens. But when I was in Kakuma, that's when I realized you can't move out of the camp. You have to wait. The food comes from the NGOs, and every two weeks you have to wait for the food, and it doesn't last for two weeks. So, we used to go to school and I sometimes when I look at it I'm amazed how we did it. We used to go to school, we didn't have breakfast, we didn't know whether we would have lunch, but we still had that heart to go to school. A typical day, you just get up, you don't have any breakfast, you might be lucky sometime. You don't have breakfast, you might not even have lunch, but we still went to school. The main problem in the camp was that sense of uncertainty. You don't know how long you will be there. I was in Kakuma for seven years, but there are the people now who are still there, that were born there, but they are still in Kakuma now. They don't know where they will go next. Can you describe your life, so you went to high school in Kenya? Yes, I went to high school in Kenya, I went to Kakuma, which is a refugee camp - it's still there, it's still there now - in 1995. And I started in class seven. One main thing, when I left Ethiopia to finish grade four, I didn't do five, so when we're in the Sudan, we had to move from place to place. So, starting in grade five and six was problematic, so I didn't actually study. I studied by myself, so when I went to Kakuma I went to grade seven, while I didn't do five and six, but I actually did well. I went to grade seven, and then in Kenya, from 1 to 8 is called primary school, but then you go to a high school which is from 9 to 12. So, in 1995 I went to Kakuma, I went to class seven, and then in 1996 I set for the exam, they call Kenya Certificate of Primary Education (KCPE), and I was lucky, there was an NGO called GRS [Global Rescue Services], it sponsored students who have done well out of the camp to a Kenyan school that was relatively better than the schools in the camp. Was your family with you? I left them in 1995, because my father, he was, you know, he had that positive attitude saying: "Oh, the war will end." And I said: "Well, I will not wait for the war to end for me to go to school. I have to go to school." So, I left them in 1995; went by myself to Kakuma. I think I was fifteen. You were fifteen, and traveling all by yourself? There was one of my uncles who took us to Kakuma, and then left us there. We had to fend for ourselves. Okay, so then, what was it like, what did you do? It was difficult, but I didn't know any one. There was some relatives, but I didn't know them. So, I had to talk to people. There were some people I knew. You have to live with someone you understand well, so it was actually very difficult for me, but I had that heart, I wanted to go to school. Some friends who came with me to Kakuma left because they couldn't take it. But how did you, I mean, you were fifteen you didn't know anybody. How did you find a place to live and how did you take care of yourself? What he did, he took us to - because in the camp there were groups - he took us to groups, and they were ethnically based. He took us to a group, but in that group in Kenya you can not get any food if you don't have a registration card. We didn't have our registration cards. We tried to get it but we couldn't. So, I remember I was in a house he left us in, and then an old man told us - because one of my cousins who went with me to Kakuma, he had an uncle. So I lived in the house for about four months and then he came to me and told me: "Look, to live in Kakuma you have to have a registration number for food, but you don't. I can not support the two of you, you have to find a place to go." And I didn't know anyone so I had to go around and I was lucky to find one family - they are distant uncles - so, I talked to them. At first they were hesitant because it's the same situation, another mouth to feed but they don't have anything to give, but when they saw my situation they were receptive, and I think after a year, I was able to get a card in Kakuma, and looking at that, someone who have said it would have affected my studies, or I would have gone back to my family, because I had family in Sudan, because the situation in the camp was worse than in Sudan, because I have a family, we can suffer together. But I didn't go back because I put the school first. So, you were determined to go to school, and the other ones - you said there were other children with you and they ended up leaving because they couldn't take it? They couldn't take it because it wasn't easy, it was difficult. And also, it depends on how you were raised or how one perceives life. But, I put education first, and that's why I think I remained in Kakuma. So, you finished your high school in Kenya. What happened after? I finished high school, after GRS, because GRS sponsors students. We have about a thousand students sitting for the exams, but they only need about fifty students, so you had to be in the top fifty. So, when I was sponsored by GRS, and went to Kenyan high school, there was another NGO, it's actually a Canadian NGO called World University Service of Canada [WUSC]. It's based in Ottawa. So, what they do, they go to these refugee camps and they look for students who have done well in high school but they don't have the means to go to university. So, they interview them, and if they see they can do well in university - they look at their transcripts - they talk, they interview them and give them English assessment and then they talk to the Canadian Embassy, to give them residency. So, that's how I came to Canada. So, they interviewed us and gave us permanent residency. So, what they do, they talk mostly to universities. So, the transcripts are sent to universities and universities they have programs where students contribute for the cost of the WUSC students. The students come under what they call Refugee Sponsored Program under WUSC. So, a student is given a one year scholarship. Everything is paid for the first year but then the other years it's up to the students to either work or get loans, but the first year is paid. So, that's why I came to Canada. I had a question about the time you were in high school. Can you just tell me a little bit about your life, when you were studying in high school, you're living with these people you don't really know very well. What was that like? What were your study habits like? What was your life like? If you could give me like a specific, like any memory that you have of that time that has stayed with you since. What time did the bell ring? I think it's about, say six in the morning. Then, you go to the dining hall to have your breakfast and then after that you go to class until you have your break. So, everything is regimented. So, you can not - it's not like here where everything is relaxed, everything is informal. Everything there is formal. Teachers are like our gods, they are like our gods. So, in Kenyan schools what helped us is, the studies. Even if you don't want to study, you have to stay in class. So, we have the classes you have the period work and some people go to play sports, then you go back to class say at 7 and then you study until around 10. So, there you have to study, and even if you don't like to study you can not go anywhere. You can not go out of the school, because if you have to go out of the school you have to get permission to go out. And we have the uniforms, so if someone sees you outside, then that's a problem. And if I have civilian clothes - sometimes they never allowed them - so when we leave the camp to come to school, you have to leave what they call civilian clothes. So, if the teacher finds it in your box, then they know you can use it to sneak out at night. So, you only had uniforms. The only thing you can use to go out is a uniform, people will see you. The teacher sees you in town because the teachers can go out: "Where's your permission slip?" Did that happen to anyone? It happened to me once because I had a friend come from Nairobi because in 1995-1997, it was terrible for me. Because I had no support at all. It was only what I got in the camp. When you say support can you be more specific? Support, for example, some people had relatives maybe in Canada or Australia and they can send them some money. When that happens, life becomes relatively better in the camp. But in 1998 my dad worked for an NGO called Sudan Medical Care, he was an administrator. So, he used to show up in 1998. Things become better because I would go to Nairobi and get some income back to the camp. How did this money affect you? How did it make your life better? It affected me because I could afford to buy things. For example, I could afford to buy things like sugar, nutritious food for example, fruits and vegetables. Were you not fed at the camp? We were fed but it was not nutritious. It was basic things like grains, sometimes oil. Oil? They would just feed you oil? Oil and grains, for example, in North America, you call it corn, but you call it maize, so things like that, but it wasn't nutritious. So, when you have some money, now you can afford to go to a Kenyan market and buy things that are nutritious. When you had to eat the maize, and the corn, what was going through your mind? How did it affect you? Well, if you had it, you were appreciative because it wasn't always available. So, if you had it, it was the only thing you had unless, for example, when I had the money, then I know now I can afford some stuff. From that moment, I know what I was eating then wasn't that good, but at the moment when I didn't have the money, that was the best I could get, and it wasn't always available, so once I had it, I had to appreciate it, because there's no comparison. What's the longest you've ever been without food? I think the longest would be two days. So, how do you study for two days without food? I couldn't tell you that, but we did it. Now looking back I wonder how we did it. It's amazing how we did it, but we did it. It was difficult. So, I left Montreal in 2007 after I graduated and moved to Calgary because I didn't pick up French. You have to be bilingual to get a proper job. So, I moved to Calgary and I've always liked to write since I was in the camp I was writing poetry. It was at first difficult to get published, so I kept on writing. I just liked the idea of writing fiction, non-fiction, poetry and also writing political articles about South Sudan. So, I started that around 2003, and we published them online. What else did you write about? Can you be more specific? I write mostly political articles, published online. And then non-fiction, and non-fiction based on philosophical ideas and also ideas based on culture. For example, as a refugee in Ethiopia and in Kenya and living in Canada. So, I lived in different cultural settings. So those have always informed my writings, besides philosophical writings. So that's how I write, so most of the books I write, they have this racial undertone, how different races, different cultures interact. So, that informs my writing. So, coming to Calgary I continue to write, but then I realize I can do things on my own, or I can even have an impact from what I write, talk to people. So, I started writing became very frequent for me, and it's easy. It's easy, for example, the book I just finished. I finished it in two weeks. The title is called, South Sudan Ideologically . So, that's the title. So now, what I do, I write my books and I do everything, even the layout, and the plan is because in South Sudan, we don't have any publishing house. So, my main purpose is to take it to South Sudan, publish ideas kids can relate to. Now, in South Sudan, they read books that were published in East Africa. Those books don't reflect anything about them. They read names that are foreign. I wanted them to read names that they can relate to, they see their names and that encourages them. They can say, in the future: "I can do the same thing," rather than reading stuff that was written by other people and they can not relate to, that further alienates them. So, that's what I do, and that's why I established The Nile Press, which is still trying to develop. And, hopefully, take to South Sudan. And I'm in communication with some book sellers in Juba, and they are interested in supporting the same, and to support literacy in South Sudan, and that's what I'm doing now with my writing. And you said you write political articles. Can you be more specific about these political articles? What exactly is happening, and has happened in South Sudan that would encourage you to write these pieces? The leadership now in South Sudan was a rebel organization, so, they were soldiers. They were soldiers who only listened to their superiors. So, if you had to listen to someone, it had to be someone who was superior to you, your commander. So now they are the government, they are the leaders in the south, and they have to move from being military leaders to being political leaders who think like the average civilian. So, that becomes a problem to them because they are not used to it. So, when they are told this is wrong they wonder, because no one else told them what to do except someone superior. So, a young man like me writes an article and tells them: "You know what, this is wrong." They don't receive it well. So that encourages us to write articles to sort of say this is wrong. What do you mean? What is wrong? For example, in terms of development, in terms of human rights, in terms of strategies to develop the country. So, the peace was signed in 2005. So, South Sudan was given some autonomy, so self-government before independence. They had their own budget, they had their own army. So what they could was to develop the infrastructure that was destroyed by war, if they existed at all. They had to build schools, they have to develop the health care system. They had to make sure, because people live on tribal basis, that people who are employed in ministries are not from one tribe. Things are slowly changing, but in the years following the CPA signing, Comprehensive Peace Agreement, if the minster was from one tribe, almost 80% of the people will be from the same tribe. So these are the things that we are criticizing. How does most of an organization being from the same tribe affect people, affect the greater population? It affects the population because people are incompetent to get employed. "Because he's my cousin, I'll just give him the job." So that means people incompetent are employed, and when people incompetent are employed development is stalled. It is stalled, it doesn't go on. …in their circle regardless of whether or not they're qualified. What else? The other thing is money gets embezzled. So if we all are from the same tribe, and the money is allocated to the ministry, we are not accountable to any one. We can do whatever we want to do with it. We can embezzle, we can lie, we can inflate numbers. We can say: "Oh the project. We have this project, for example, to build a road and then instead of saying it was 30 million, we say it was 60 million" and the rest who are around me are from my own tribe, so they can not rag me out. So, we just do it. That means the money that would have gone into development is now going into the pocket of people. So that is one of the things that we're saying. The other thing is ideas, different ideas. If different people come and they sit together that means that we can think about things that can move the country forward. When you say different people, different people from different tribes? From different tribes. If we are from the same tribe, and we work for, say, the ministry of transport and we are in charge of allocating money for that ministry and someone comes for example from a different tribe asking, you know, money, for roads in their area of the country. We'll not be that receptive to them as opposed to someone coming from our own place, they are our people. So, we'll be easy with them. These are some of the things that we are telling them, they're wrong. And this is still happening? It's still happening. It's still happening because it's not easy for them. One of the problems we have, one of the major problems, the leader who was a leader from 1993 to 2005 when he was killed in a helicopter crash, he was well educated, he was educated in the U.S., he had his Ph.D. in the states, he was a strategist. He would tell you, this is Plan A, this is Plan B, this is Plan C, if A doesn't work, we go to the second one. So he was a strategist. The leader we have now, not well-educated, not because he's not well-educated, he's not a strategist. Can you tell me the names of the two leaders? The first one was John Garang, that was the first leader, he died in 2005 in a helicopter crash. He was a strategist. The current leader now, his name is Salva Kiir, he's the current leader. He's relatively politically okay because he's a general, he's a diplomat but he's not a strategist. So, he listens to people who are not helping the country, so he listens to ideas that are not leading us anywhere. For example, the first thing he did was, the leader who died in 2005, decided to say he didn't like tribalized politics, so he decided to put people as governors from different tribes. For example, I'm from a state called Jonglei, so instead of somebody from Jonglei being the governor, he put someone from a different state because he wanted to do away with this tribal politics, and he had a plan. I think, about a ninety day plan or some years' plan. So, when this new leader came he did away with everything. So, now, he's back to a tribal system? More, yes. He doesn't have long-term plans, which we can see as working, and now we've seen in the last few days things became really really bad because since 2005 nothing has happened. People became disillusioned, services are not being provided, sometimes civil servants go for months without being paid. No one is accountable. No one is accountable for: "Where is the money exactly? Why are people not being paid?" In his own state, the president, people are dying of hunger. Why? And they drive these fancy cars, these SUVs. The ministers. The leaders the president. The lawmakers? The people in charge? The cars are bought by the government. They are fueled by the government, and we say people are dying and you're buying cars for them. They get salaries. Why can't they buy their own cars? But we can not say that because, they say it, so they have it. This is one of the problems of the new president. He's not receptive to being criticized. Journalists are being arrested. Dissenting voices are being sidelined. Now we have the president, he dissolved the cabinet, the whole cabinet, the vice-president. The vice-president had gone public saying, "You know, we're leading nowhere. We have to change." So, he didn't like that. First, I think the vice-president, didn't do it well because he went public and criticized the president in the foreign media. So, that was bad. But all the things he was saying are okay. Services are not being provided. People who actually criticize the president or tell the president what to do are sidelined. So, that is the big issue we have now in South Sudan. There is much tension now with the vice-president who was removed. The other thing is the constitution is not begin followed. So, when something favours the president, then he does it based on the constitution, and sometimes, for example, how do you fire an elected governor elected by the people? So, there's a provision in the constitution that says the president can remove an elected governor if there's a crisis. So, he has used the provision in the constitution to remove two, two governors. But, there's no crisis. Even if there's a crisis, it has to be a crisis threatening national security. That's what the constitution says, but he goes ahead because he doesn't like them. It's personal reasons, but what can we do? A few weeks ago, about a week ago, when we had the new vice-president, because he has to choose a vice-president, and then the parliament now can vet whether to accept or to reject. Two weeks ago, we had the cabinet, so people were vetted and one minister was rejected. He was a legal advisor, and they put him as a minister of justice, but parliament rejected him. The president said fine, he accepted it. But when he appointed someone to be the vice-president, his name is James Wani Igga, who was the speaker of the National [Legislative] Assembly, he knew there was a potential for the parliament to reject him, so he called the caucus, the SPLM, his party, and intimidated them. "If you don't accept him, I'll resolve the parliament." He intimidated them. So, when they went to the parliament, they did not follow the due process all they did was accept him as he said, and he's now the vice-president without any vetting of the parliament. Is there a large South Sudanese community here in Calgary? It's large, we don't know the exact number, but it's estimated between fifteen and twenty thousand. Do you do some campaigning from here in Calgary? No, we don't. We don't do that. The only thing we did was the referendum, when the South separated that's when people became really active politically, but in terms of what they are doing, we don't campaign for them, but there are some people who identify with some political parties. How do the people from South Sudan respond to what's going on right now? Because you're living here in Canada but you all still really care about what's going on in your home country. So, can you tell me a little bit about the community and how you respond to what's going on back home? It's a little bit murky because when Sudan was still one many South Sudanese used to, you know, go to City Hall waving the flag saying this is happening. For example, with the Talisman, the Canadian oil company, used to work in South Sudan and they were forced to leave because of the atrocities being committed by the government using the money they got from oil companies. So, people were active and anything that's happening, for example, the government of Sudan killing people in Darfur or in the South, people are active. Now, South Sudan is independent. It's independent, but what is happening in the South is something that we don't like. It's just like Khartoum has been transferred to Juba, because Juba is doing exactly what Khartoum was doing, but then the problem is can people go on the streets to condemn the government. No one has done that yet. So we just talk, but we have not taken an active role to do what exactly we did with Khartoum. We would go and say, Bashir, the president of Sudan is killing people, so we go to City Hall, we go to the media, talk to the media, but with the South, they are confused. They don't know what to do. It was the government that we thought would actually give out the services that we want. But now, it's doing exactly what Khartoum was doing, killing people, censoring journalists, sidelining dissenting voices. So people don't know what to do. They don't whether they need to go on the streets to City Hall to condemn the government that liberated them. So you can see the dilemma here, people are confused. But online, people are active. We are writing articles, and they have an impact. And when you say, "We are writing articles." It is you and? Here in Calgary, and the U.S., Europe, and Australia, people are writing all these things. You are a writer. You're a poet, you're a writer, and you are also a publisher. Can you tell me a little bit about your publishing company? In publishing, I started to sort of present ideas based on the perspective of South Sudanese, because most of the time if you go online or go to the library you have so many books that have been written about South Sudan, or even about tribes. For example, the Nuer tribe, if you've taken an anthropology, an elementary anthropology course, you would see Nuer, they are well studied. But the perspective that is presented is not ours, so what I wanted is to present things using our own perspective. If I write, for example, and send my manuscript to a publisher they would want it to fit a certain angle, they want to serve, they have some audience. And I have said, "Okay, what I will do is to write in the way I want and also solicit ideas from South Sudanese and see how they view things. I'll give you an example. In 1947 Juba Conference, there was a conference before the independence of Sudan from Egypt and the British. British administrators in the South said, "You know, these people are different. They have to go their own way." So they convened a conference. There were only chiefs, because South Sudanese were not educated then, there were only chiefs, tribal chiefs and some clerks. So they were confused, they say we are different. We are not educated so give us time before we can become independent. But the British and the northern Sudanese they decided to hoodwink them into unity. So now, when people write about that event, many scholars have written, and they say these chiefs were not educated and that's why South Sudan was part of Sudan, so they were confused because they were not educated. And I say, no. It's not because they were not educated. It was the kind of people they were dealing with. If you look at the minutes of the conference, which are also available to read, they said exactly what was good for South Sudanese even if they were not educated in the Western context. They knew what was good for their people, and they said it at the conference, but they were ignored. So, it's not that they were not educated. It's that they would not have been listened to even if they were educated. So that perspective is not, you can not find it. That's what we have to say now. If I read the book, I don't find it, and I say why can't I say it? Why can't we say it that way? And so that's why you started this publishing company? That is why, to actually present our perspective. When did you start your publishing company? I started it in 2012. In the beginning of 2012, and then I had it registered in August of 2012. I have written about nine, but I've published seven. These seven books you've published with your publishing company? I published five with mine, but two with a different publishing company. These books are all about South Sudan? No. I have two novels. The first one is immigrant experiences, an immigrant family and how they relate to life, and how they get transformed as they live in Canada. It's just immigrant experiences. The second novel is a political novel. It's mostly about the relationship between the West and Africa and then political dynamics within Africa, how leaders, you know, some leaders, sometimes they occlude with multinational companies that invest in Africa. So, some self-interested political leaders, you know, they misuse power. So, that's what I looked at, and then how the West relates to Africa in terms of economics, political issues. So, that's a novel, the second novel. I call it The Pipers and the First Phase. The Pipers is a politically active group that tries, you know, they want to change the world and an unconventional way. What they do is they infiltrate governments and take inside information and condition government and individuals to do things for poor people. The other is a non-fiction book on race, colour and racism. Then, there's one children's book. Then, two poetry books. Are these books fairly well-received in South Sudan? Yes, the only thing is access to books in South Sudan is difficult, but for those who have them they do appreciate them because it sort of gives them some hope. It gives them a sense of pride, "Oh this is something from my own place, and I can also do it." And I've seen many people now are trying to now, "Oh, I can actually do it. I want to write a book." So, it gives them a sense of pride and that I can also do that if he can do that, and that means a lot to me. You said they give people hope. But, then what else do you see your books doing for the people? For the people, it's how they think. It's also how they think, because for example, myself, I don't affiliate with any political party. But South Sudanese now, you know, they have to relate. Someone will say, "I'm from SPLM or I'm from this party." I don't do that. So, when I have ideas, I don't associate them with any political party. So, they might not be as objective as someone would want them to be but they are not partisan. So, when people look at things that way it makes things easy. The second thing is tribal problems. So, when I write, I can criticize my own tribe, I can criticize other tribes, but when I criticize, I have to acknowledge the good things they do and then now let them know this is wrong. But that's not the culture that we've developed in the South, we don't have it. So, sometimes someone can criticize someone because they are from a different tribe, but my tribe, I don't want to criticize. That's what I want to change. So, people, when they read my work they can see that i criticize my own tribe. One of the major things is, that are people, we have a cult of personality where see some people as completely, they can not be criticized. So, I see that's wrong. As long as you have a good case against that person. What people have to remember is all the time, say, for example, look at the president, I criticize the president, people think I don't like him. I say, "No, it's not that I don't like him, I don't like what he's doing." There's a difference. As a person, there's no problem. So, I can criticize him, but I can say, "Oh, he's a good person in this way, and this is one thing he has done, but, this is the problem, and that's one of the things that my books, and I hope my books would encourage in South Sudanese to think that way. The latest is a book, I call it South Sudan Ideologically, so it's mostly idea-based, where I look at ideas from, I think, at the beginning of 1940s to the present. So, I looked at how South Sudanese related to the Sudanese Arab, how they related to the British, and how they related amongst themselves, and how the First Civil War affected them, the Second Civil War, and now in Juba, what is happening in Juba. So, it's not a comprehensive historical account, but it's an analysis of ideas, historical figures, the most important events in South Sudan. So that's what I looked at, and again, coming to the last question you asked, how we can change how we view things, how we look at one another, because if we don't change how we look at one another, then things would become really difficult for us. If I don't see an individual as an individual, whether they're form Nuer, from Shilluk… I don't care I have to look at them as an individual, what do they have to contribute to South Sudanese? [If they say] "I don't even want to go further to see the personality, the ideas, what they can contribute, I just look at from [there] no I can't talk to them. When you're saying these people are from this city or this city, are they from different tribes? Different tribes. Tribe is the major problem. It's approximated, we don't have the exact number. It's approximately 160 tribes in South Sudan, but the major tribes that control power, and you hear in the news is Nuer and Dinka. It's as if these are the only tribes in South Sudan. So, when people hear about them they are seen as having controlled power, and having misused power, but there are so many other tribes. So, the main problem is the leadership is controlled now by the Dinka. If you look at the army, the majority of the people are Nuer. So they are seen as the only two people ruling the country and that becomes problematic sometimes, or most of the time. South Sudan Ideologically. I looked at historical events, but then I also suggested, because what I always want people to know, is when you talk to people, when you want to tell people, always if you criticize them, suggest something. Tell them, this is what I think, and this is why I think it's better. And then they will have to respond, "We rejected this way, and this is why." And that is what we need to develop in South Sudan. Now, if I go to South Sudan and criticize people, it's not good. I can get in trouble, and we had a young man, not a young man, he was in his late forties or fifties, he was also an opinion writer like me. So, he was killed in December of 2005 at his home. He was shot point-blank. And we had some articles written, my name was mentioned in an article that we are some of the people the security forces don't like. People were telling me, "Don't go to South Sudan. You're in danger." And that's one of the issues that we have, and I want people to change from that mentality. If I say something against you, you have to sit with me and say, "What you just said is wrong, but this is why it's wrong." To convince me with facts, and that is what the leadership wants to do. So, in one of the chapters, which I call "The Way Forward", I suggested what I call accountability models, financial accountability models, tribal accountability models, because now we have in Jonglei state, one of the worst states, there's always fighting, especially between one section of Nuer, called "Lau" and then the "Murli". They are killing themselves all the time, and the army can not do anything because we have about ten thousand people going to the "Murli" land. The army can not do anything, that's too much for them. So, I suggested ways in which the leadership can actually help because it's not all the time about money, it's about ideas. How can we use the tribal leaders, to make sure that their tribe can coexist, we suggest something that is long-term, which we don't have. We don't have any accountability model they have put in place, we don't have even financial accountability. The minister gets the funding, and decides what to do. He's not accountable to anyone. We need a way in which everyone else - if we have the directorate in the ministry - if the money comes to the minister, allocated to directorates, and then we have departments under directorates, we have to have a chain of accountability where you get the funding, you know the person who gives you funding will come tomorrow and ask, "What have you done?" That's not the case, so I suggested to build this accountability as a way forward. The other thing is political accountability is a big issue. The president is everything, he can decide something, no one questions him. When he suggests something, for example, "I have a ten-year plan" and then, during independence he said has a ninety day plan. He had to achieve some things ninety days after independence. Then we said, "Fine, let's wait." After ninety days he did not come through. He didn't say to the people, "This is what I promised, this is what I achieved." He's not accountable to anyone. A good leader would come, "I achieved this, I failed on this, but this is why I failed." He doesn't do that, so I suggested accountability, where he can come to the people or the parliament and let them know, this is what we are doing, this is where we are failing and this is why. So, that's what I did as part of the book. In your book do you actually give a model for what a leader should do? Is there a leader now, like a president or prime minister somewhere in the world that you base your ideas on, of a good leader? I do that, I do some research and what other people, I don't actually take a leader, for example, "You need to be like this." But I can take ideas from that leader. That leader has done this and this, and also look at research, because there are some people who have made it as their career to study leadership. For example, I have a quote from one of the American scholars who said, look at Mandela, and look at someone like Steve Jobs, they had a goal, but they also asked themselves, "How do I achieve it? And who can help me achieve it?" That's what a good leader does. What do I have to do, how do I do it, and who can help me? And that's what a good leader does. For example, Steve Jobs wanted a portable computer. That's what he wanted to do. Mandela wanted a South Africa where everyone lives together, but how was he to achieve it. He went to prison as a militant, and I don't know if you read. Before he went to prison, he was a militant. But then when in prison, he changed drastically because he wanted to see how could he change South Africa inside prison, and he did that because he knew the way and he had to get allies, and that's what I do. So, I don't take an example of a leader, I take what a leader does. And you said he had to get allies. So allies from the entire population? Whoever can help. For example in South Sudan, the allies could be people from different political parties because SPLM, Sudan People Liberation Movement, which is the ruling party, is almost, the parliament is almost 90% SPLM. So, how do they get allies in terms of the political leaders from the civil society, just civil society, from the students, from the international community, NGOs, whoever can help in terms of development. It's one, as I said, it's a perspective, that is one. The second thing is also, the events happening now, the events happening, because I write articles all the time, but the articles you read them and they are gone. I want something that can actually be there. They can reference it all the time. That was a major motivation. Two weeks. I think editing, and I have to confirm some research, that's what took me, I think, about a month or two, but actual writing, is just two weeks. What do you hope these books will do for the people of South Sudan? Just to change the way they look at themselves, and that's what I emphasize all the time, how we look at one another should be different. There's one major event, 1991, where SPLM split and people actually died. South Sudanese fought among themselves, they were supposed to fight the government of Sudan, but they fought among themselves. 1991 created a legacy that still exists even now. The former vice-president split from the leader of the mainstream SPLA [Sudan People's Liberation Army] and people fought. Now, people look at themselves on a tribal basis, especially that created a divide between Dinka and Nuer. They used to fight occasionally, but it was on a small scale. So what I hope to see is things happen, but for us to move forward there has to be an angle in which we look at them. So, the major thing is tribal issues. We look at ourselves differently, I know I have friends now who are from different tribes, I don't look at them as Nuer or Dinka, I look at them based on - I can dismiss them because I don't like their ideas, I don't dismiss them because they are from X tribe - and that's what I hope to achieve with the books. Awesome, Kuir thank you so much for being here, and for taking the time today to speak to us. Thank you too Melissa, it was my pleasure to be here.